Ending the season with 39 points and narrowly missing out on second place, the men’s team got off to a great start in the playoffs by sweeping the University of Ontario institute of Technology in the first round. With a goal and an assist in the series, Neill is continuing to make his presence felt in the postseason. The 21-year old, who is in enrolled in the Certificate in Arts program, has been a major contributor to the team this year. Stingers’ head coach Marc-André Élément has openly applauded the way he’s managed fit in with the team so seamlessly. Élément isn’t the only person who sees this potential. In 2015, he was drafted by the Vancouver Canucks in the fifth round from the Sherbrooke Phoenix of the Quebec Major Junior Hockey League. He had put up 90 points for the team he was drafted from. 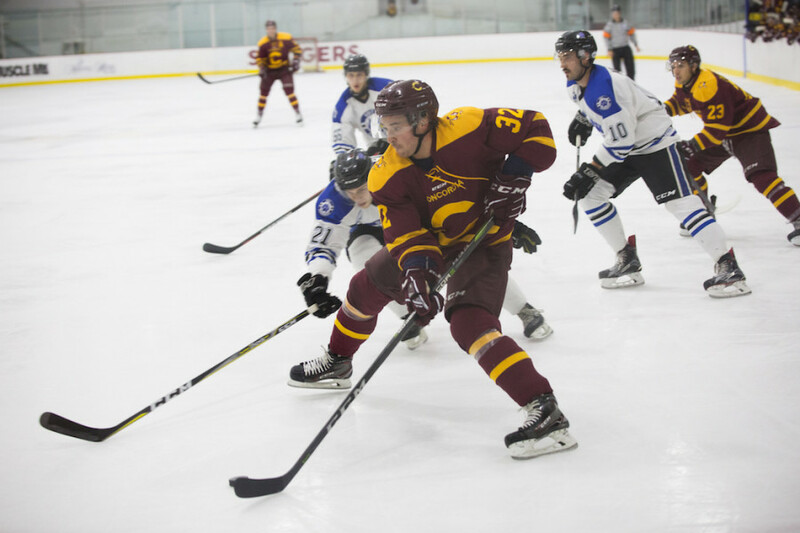 After electing to focus more on his education before hopefully returning to professional hockey, Neill moved from the QMJHL to university hockey, signing on with the Stingers. The main goal is for him to obtain his management degree and then return to a professional league, Neill told U Sports earlier this February. Related: Two Stingers Men’s Hockey Players Finish Season Amongst U Sports’ Best. Neill said his recruiting visit at Concordia went well, and he already knew some players on the Stingers roster coming in. “It’s a good vibe here,” he said. The defender’s first year suited him well, finishing the season with 31 points in 28 games, the most by any defender in Canadian university hockey this season. Neill has also represented his country on one occasion. In 2013, when he was a member of Canada’s National Men’s Under-18 team that won the gold medal at the Ivan Hlinka Memorial Tournament, a competition held in the Czech Republic and Slovakia every year. When asked about a potential shout for Rookie of the Year, Neill maintained that the team and their objectives came first. “Maybe when the playoffs end I can think about that, but right now everyone is focused on winning the next game and you can’t really look at outside distractions like that,” said Neill. Regardless of whether or not he does end up winning that award, the Stingers seem to have found themselves a gem who has a chance to evolve into one of the top defenders in the U Sports.